The Iowa wide receiver is generating a lot of buzz before even playing in a game. Editor's note: This story has been updated to correct the location of Union High School. IOWA CITY, Ia. — Every time Jay Scheel tries to tamp down the hype, someone inside the Iowa football program ramps it back up. On Wednesday, it was offensive coordinator Greg Davis who offered the quote of the day about his soft-spoken sophomore wide receiver. Scheel, a speedy 6-foot-1, 195-pound former quarterback at Union High School in La Porte City, is quick to point out the obvious — that he hasn’t yet caught a pass in a game, sitting out one season after getting over knee surgery and not playing last fall because ... well, he’s not quite sure. But obviously Davis and staff didn’t feel he was ready to even travel with the Hawkeyes during a 12-2 campaign. 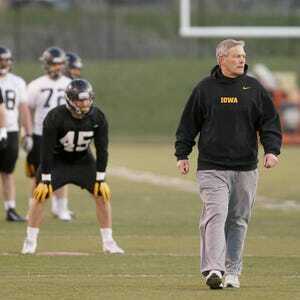 Scheel doesn’t want to be merely the latest Legend of the Spring at Iowa, following in the steps of recent head-turning wide receivers like Cameron Wilson (10 catches for 131 yards in 2013’s final spring practice) and Derrick Willies (five for 142 in 2014). Neither of those players did anything particularly noteworthy in a Hawkeye uniform before departing for other schools. Scheel, at least, figures to stick it out at Iowa. He said playing for the Hawkeyes was a childhood dream and he was happy to switch positions if it meant getting onto the field at Kinnick Stadium. This fall, there is a black-and-golden opportunity in front of him. Wide receiver Matt VandeBerg (65 catches, 703 yards last season) and tight end George Kittle (20, 290, six touchdowns) figure to be the top two targets for Beathard, a senior who was second-team all-Big Ten Conference a year ago. A reliable third option will be a necessity. And that’s what Scheel is battling to become. “We’re all competing for spots. I think that’s what is driving all of us to go out and make the most plays that we can,” Scheel said of a wideout group that includes Jerminic Smith, Riley McCarron and Adrian Falconer. Davis singled Scheel out for praise, saying he had been particularly impressive in the past three or four practices and was showing the ability to play at both outside spots. Backup quarterback Tyler Wiegers also spoke of Scheel’s impressive spring showing. “He’s really healthy so he’s been able to show his speed. He’s been getting better at the nuances of route-running so he’s a good option for all of us quarterbacks,” Wiegers said, noting that it was obvious Scheel had some signal-caller in his background as well. Iowa's backup QB to C.J. Beathard excited to show what he can do. Scheel appreciates the compliments, but he’s trying to tune them out. He certainly wants fans at Saturday’s final spring practice to see what the talk is about, but more importantly, he wants to be able to back it all up once the games count this fall. “It’s all good and well to get mentioned and everything but you can’t think about that kind of stuff. Because if you think about that kind of stuff it gets in your head and that’s all you think about,” Scheel said.